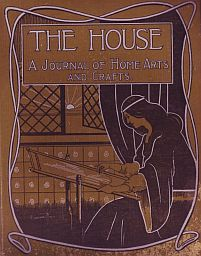 In the introduction to the first issue of The House, the editor observed that “There are now dozens of journals which have to do with the dressing and adornment of the body; but strange to say, there is not one dealing exclusively with the dressing of the house.” This, they asserted would be the function of The House. Over the next five years the magazine covered every conceivable aspect of the furnishing and management of the Victorian home with articles on furniture, lighting, wallpaper, carpets and rugs, tiles, art needlework, ceramics, glassware, decorative woodcarving, stained glass, art metalwork, etc. Among artists, designers and firms whose work feature in The House are Walter Crane, Liberty & Co., Heal & Sons, and John Ruskin. The influence of the Arts and Crafts movement is evident.